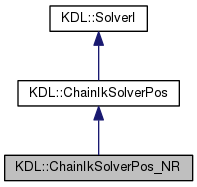 Implementation of a general inverse position kinematics algorithm based on Newton-Raphson iterations to calculate the position transformation from Cartesian to joint space of a general KDL::Chain. Definition at line 38 of file chainiksolverpos_nr.hpp. Definition at line 26 of file chainiksolverpos_nr.cpp. Definition at line 70 of file chainiksolverpos_nr.cpp. Definition at line 42 of file chainiksolverpos_nr.cpp. Definition at line 74 of file chainiksolverpos_nr.cpp. Definition at line 35 of file chainiksolverpos_nr.cpp. Definition at line 82 of file chainiksolverpos_nr.hpp. Definition at line 87 of file chainiksolverpos_nr.hpp. Definition at line 89 of file chainiksolverpos_nr.hpp. Definition at line 42 of file chainiksolverpos_nr.hpp. Definition at line 41 of file chainiksolverpos_nr.hpp. Definition at line 92 of file chainiksolverpos_nr.hpp. Definition at line 88 of file chainiksolverpos_nr.hpp. Definition at line 86 of file chainiksolverpos_nr.hpp. Definition at line 85 of file chainiksolverpos_nr.hpp. Definition at line 91 of file chainiksolverpos_nr.hpp. Definition at line 84 of file chainiksolverpos_nr.hpp.